Gamer’s Rhapsody 3 was, as one could infer, the third go of a convention focused on the art and music of video gaming. As the red-rings-on-my-face target audience for this convention, I’ve been following this con closely, including enthusiastically reviewing last year’s event. The Midwest has a lot to offer nerds of all flavors, but those of us who are die-hard fans of the elements of gaming often overlooked—scores, sound effects, script writing, character design, background art—the idea of this con seems like home. A place to celebrate and indulge in these elements, but also a place for creators to connect and network. There is a lot of talent in the Twin Cities, and indie games are booming. Why then, did it fall so short this year? With the tear-down of the convention’s former home, the Ramada Bloomington, it moved across town to the DoubleTree kitty-corner from the Showplace ICON Theatre. The venue was my biggest point of criticism last year, so I was hoping that the new hotel—which was an upgrade in some ways—would fix some of the issues with flow and function I’d had issues with. Unfortunately, it was clear from the moment I got to the DoubleTree that this would not be the case, and my 2016 experience immediately got off to a bad start. When I arrived, I came in (as I assume most would) though the main entrance of the hotel. The only signage in the lobby was for a wedding, and I wandered for a while in search of the convention space—going up and down several mini sets of stairs, getting lost in an elevator bank, and passing through labyrinthine hallways. I ended up in an alcove with a very busy, and very loud, swimming pool. Still no signage. I finally found a table (up another tight set of turning stairs) with a poster board that said “8 Bit Run.” Because I follow Gamer’s Rhapsody on Facebook, I knew that the 8 Bit Run was an affiliated event, and that I had probably finally found the place to be. This is obviously an issue. Not only was getting to the registration table an accessibility nightmare, but I had to use my prior knowledge to discern that it even was the place for registration. I picked up my badge and went in search of the Twin Cities Geek table, where I planned to help with staff. We were set up in “the grid,” a combo dealer and exhibitor hall, which was over by the pool and away from everything else. There were a few dealers with the standard con fare and a handful of people promoting their projects. But I didn’t have much time to look—we were alerted, via someone flipping the light switch on and off, that the room was closing up. At 6:00 p.m. On their main day. Having failed my “help staff the booth” role, I wandered out with editor-in-chief Hal Bichel in search for what else the con had to offer. We roamed more hallways with minimal signage (though we did see a handwritten one taped to a door that said “staff” and was clearly not a hotel sign) until we found a gaming and hangout space. It had several LAN computers and some systems set up, and it was the most densely populated area I saw—which isn’t saying much, as I counted about 20 people. Unimpressed and not in the mood to do something we could have done at home, we went to the main-stage area to check out musical group Bards of the Goddesses, who were working through what seemed to be a soundcheck. I bring that up specifically because this was happening during the posted performance time, and in front of an audience of about 10. On either side of the stage were projector screens displaying the Bards of the Goddesses logo—except that they were showing an image brought up onto the desktop, lightbox style, with all of the icons in the dock and the background displayed as well. The projected images were also crooked and looked sloppy. 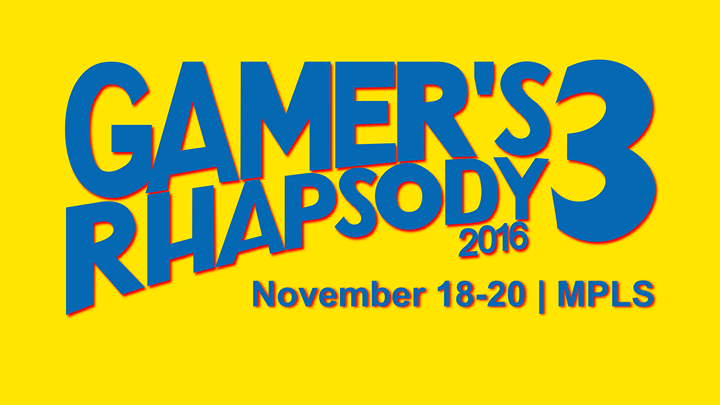 This is, admittedly, very nitpicky, but Gamer’s Rhapsody is a paid event. The disregard for aesthetic or cohesive branding was a consistently overlooked theme. Not wanting to hear a string soundcheck, Hal and I went to find what else there was to do. I have yet to determine whether our fortune was good or bad, but we ended up in the panel room. A note had been taped to the door announcing the cancellation of the scheduled panel, “Sharers 101.” Instead, we were presented with . . . the Tetris panel. Yeah, that’s right. Tetris. 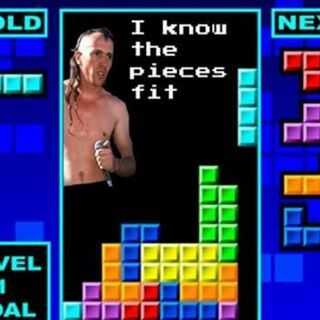 The music of Tetris, yeah? The art of Tetris? No. Just some guys with a projector showing spreadsheets with scores of competitive Tetris players. I will take a moment to say here that starting your panel by saying, “I like my video games like my women, one at a time” is probably not the best move. The audience of this panel consisted of me, Hal, a guy who had been following the two of us and ended up leaving, two women who turned out to be the panelist’s wife and her friend, and two other guys. The panelists spoke for around 10 minutes about playing Tetris, decided there wasn’t a whole lot to say about playing Tetris, and then opened up to questions. One audience member asked whether there was music the panelist preferred while playing, and he went on to call them songs A, B, and C.
Personally, I like my video games like my men: Maynard James Keenan. Okay, so wait. We are at a convention whose focus is on the art and music of gaming. Not once did the panelists mention, or seem to know or care, that the majority of the music in Tetris consists of NES variants on Tchaikovsky tunes. You know who Tchaikovsky is. Even if you don’t know the name, you know the music. Promise. Again, nitpicky, but if you are going to present a panel at a con that focuses on music, maybe be prepared to talk about . . . the music. The panel ended very soon after that, and by 7:00 p.m., that was it for the night. All that was left to do was see whatever show was playing in the main-stage area, wander back into the gaming room, or chat it up with the dead-eyed hotel employee running the cash bar. I had planned on staying most of the night, but I ended up taking off after a few hours. I had such high hopes for this convention, so much so that I’d attempted to get involved at the con-running level and offered to do panels. It is a great concept with a big, untapped audience. But at the end of the day, this year’s convention felt like a private party for a group of friends charging admission to justify the cost, not an effort to connect with or build a community. If there was a con suite, I missed it. If there were other events or things to do, we couldn’t find them. If there were other places to see, they were not accessible. Some things are what they are. Location is hard, and it’s the element that is often out of control of the organizers. But having clear signage is not. There were countless things that could have been made infinitely better with a minimal effort. There are a lot of things I am willing to forgive, or blame on myself and my own standards, but unless there is a serious overhaul to the running of this convention, I am calling game over on Gamer’s Rhapsody. Ansley is a writer and illustrator working out of Silent Hill—er—St. Paul. She is an avid fan of soundtracks, video games, and all things spooky. Beat the Heat and Play Games at Your Local Library This Summer! Year 4 is this week! So many changes and so many exciting things are in the works. Game on, Ansley Grams.